Please check out my page on Facebook. Like it while you're there!! 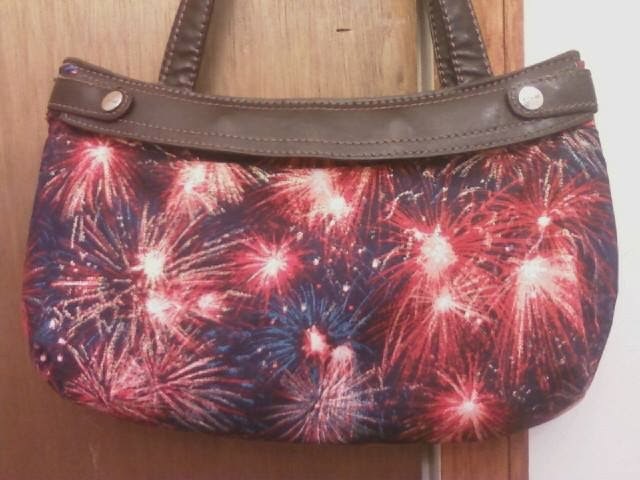 I have updated my Picasa page to reflect all the items I have made and sold or given away, and to reflect all the items that are now available for purchase. Just click the link on the right side of my page. Remember, I don't charge shipping, and any of these items would be a great gift! I'm always looking for new ideas and new projects, and I'd love any feedback you have. Please be sure to share this blog with your friends so they can find that perfect gift too! Love you all!!! I have had the priviledge of getting to know Kayla, one of my great co-workers at Chick-fil-A. She has a sweet baby due very soon, so I wanted to make a special blanket for her. It was so fun to make this with her in mind, and they really loved it! I would love to make one for a special little one in your life, or for a gift for someone you know & love. This size and style blanket is $40. As usual, it's hard to believe how quickly this year is going by. It's already the middle of August! I have been working on several craft projects, a few for myself and a few for the business. I still really love this craft, and am so thankful for Susan's knowledge, tricks, & tips. 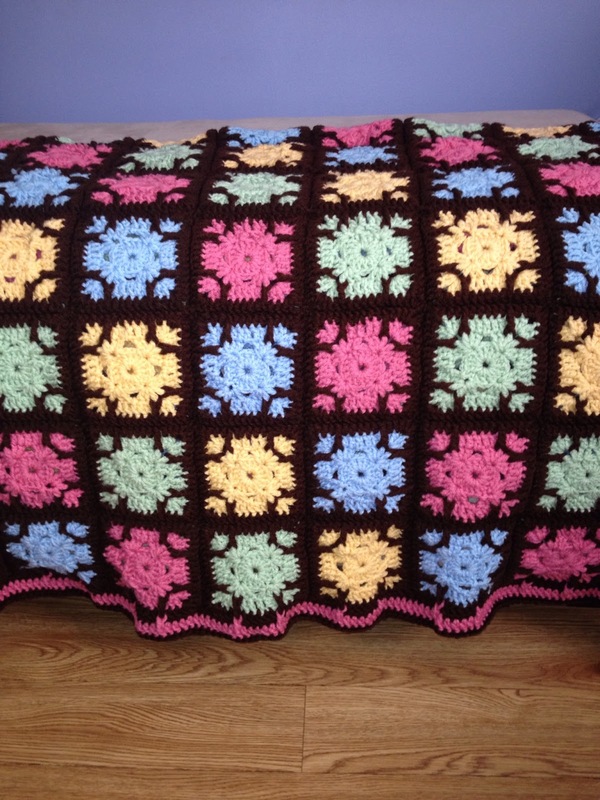 I have 2 afghans ready to be sold, I hope you love them as much as I loved making them. The red & blue is 45" x 30" and is $65. The pastel squares is 50" x 38" and is $75. Either of these would make a great Christmas present! Please share this with your friends, you never know who is looking for a fabulous hand made gift. I have a sweet friend who recently gave birth to a set of precious twins! 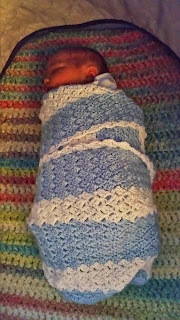 She has known for months that she was having a boy and a girl, so I made blankets for her bundles of joy. Here is the one for her son, and he is swaddled perfectly! 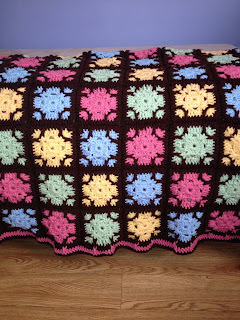 This style blanket is about 27" square, can be made in any color, and is $40. Most of my creations can be made and delivered within 3 weeks. I do not charge shipping or tax. I've noticed that God likes to change things up in our lives. The changes usually aren't anything close to what we think should have happened, but as we look back, we see that the changes were for the best. I don't know why I am surprised every time He does this, but I am. I have recently gone through a change in my career. I have been praying for several years for Him to let me be a house wife, but neither the timing nor the situation have ever been right. Last December He took me away from the job I had held for more than seven years. It was devastating at first, but as I look back I see it was the right thing and the right time. I am not yet a full time house wife, but I am on that track! So as I acclimate to my new 'career', I am tackling all the UFO's (UnFinished prOjects) in my sewing room. 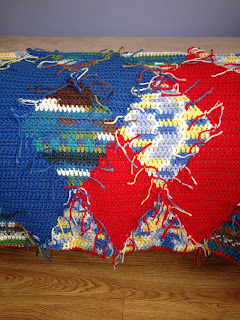 I finished a blanket for my husband before Christmas, a crocheted afghan yesterday, and a latch hook that's been taking up space for almost 20 years (really!). I have a few new things to add to my collection, and these items are all available for sale. Please remember me when you're starting your Christmas shopping lists-hand made gifts are the best! I want to thank each one of you for your support and prayers and purchases throughout the years. Much love from me to you! It's hard to believe how fast time goes by. Unless you're a teenager in high school, that is. We all wished we could be done with school and get started with our lives. Little did we know how hard our lives would be! Or how hectic things would get, or how fast time would go by. So here I am, 40 years old (also hard to believe), and trying my best to get through each day, one at a time. And trying not to keep wishing my life away. Didn't really mean to go there, but sometimes it has to be said. So, I just wanted to remind you all of the crafts I have to offer, especially since it is getting closer to Christmas. Any order can be shipped to you, free of charge, and if I don't have one made, I can make it within three weeks. I know that people really appreciate hand-made gifts. It's more personal than store-bought. To help you decide, here are a few picures to give you ideas. Don't forget to click the link to my Picasa page-there are plenty of other ideas waiting there. 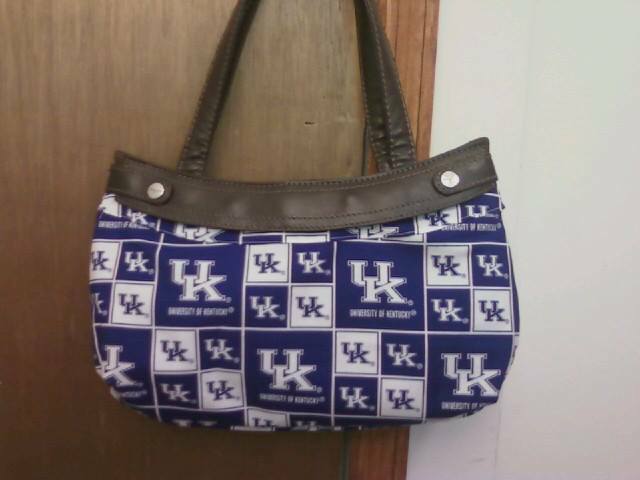 Call me (423-260-5970), email me (racreations73@yahoo.com) or message me on Facebook (either Mindy Stewart Jacobs or Rachael Adele Creations). I would love to share these gifts with you and your loved ones! I see it's been quite some time since I've updated this blog. As usual, life just gets in the way. But God has truly blessed me in this life. So here I am, starting another project and adding a new item to my repertoire. I will continue to add new pictures to the album on Picasa, and will not be charging any shipping for these skirts. 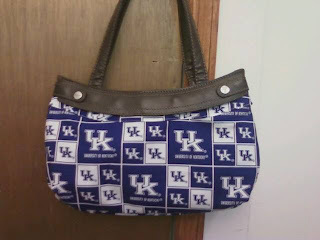 Most of them will be $10; the licensed ones, like UK, will be $15. I hope to find a pattern you love and want to show off! I met my birth mother, Susan Graham, in 2002. 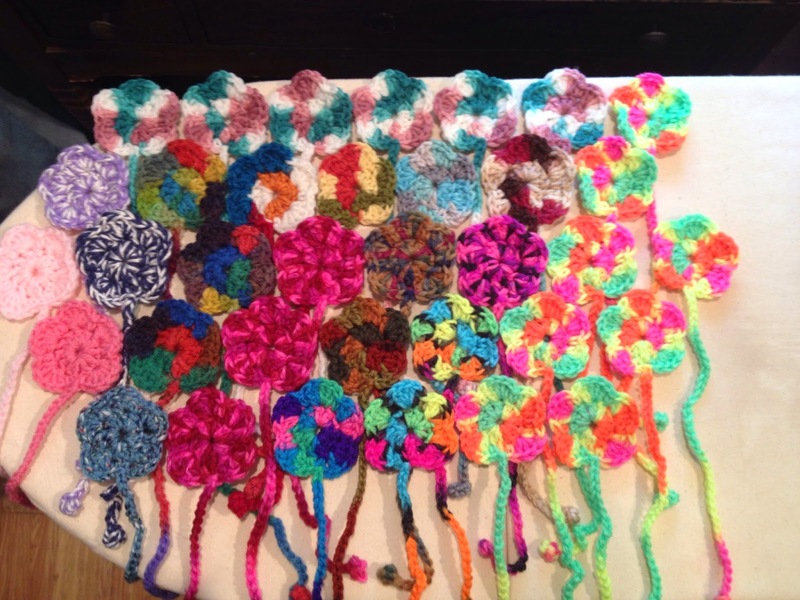 She shared with me her passion for crocheting, knitting and quilting. I immediately fell in love with these crafts! This site was created to share in the gifts I have given and to share new creations with others.